Left to right: Talon True, Roen True, Isaac Zimmer, Diane Reed, Leif Aubrey-Smith and Taylor Porter, all from Fort Smith. Racers give it their all on the trail and then come inside the clubhouse for camaraderie, hot food, and to get their rewards. Left to right: Moira Green and Gillian Furniss from Yellowknife, Anaïs Aubrey-Smith, Sarah Porter and Finnlay Rutherford-Simon from Fort Smith. Fort Smith skier Isaac Zimmer motors toward the finish line on the second day – the skate section – of the NWT championships held in Fort Smith over the weekend. Organizers were thrilled to hold the event outside of Yellowknife for a second straight year. Racers Calista Burke, #60, and Lacey Furniss, #81, come boiling out of the bush, blasting along on perfect trails. Taylor Porter, #63, is caught on the trail! The Fort Smith Ski Club will host the territorial championships again next year in preparation for the Arctic Winter Games in 2018. Brothers Jaxin Coombs, 3 (left) and Kason Coombs, 5, from Hay River, were among the smallest competitors at the NWT Ski Championships in Fort Smith last weekend. 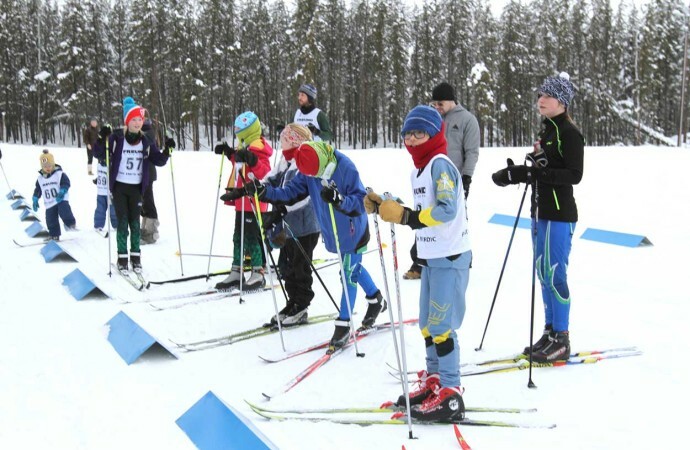 Skiiers competed in a classic race on Saturday with interval starts and a freestyle race with a mass start on Sunday. Organizers were thrilled to hold the NWT Ski Championships outside of Yellowknife for a second straight year. They will be held in Fort Smith again next year in preparation for the Arctic Winter Games in 2018. Click on the slideshow above to view captions.Photos: Don Jaque and Peter Curran.